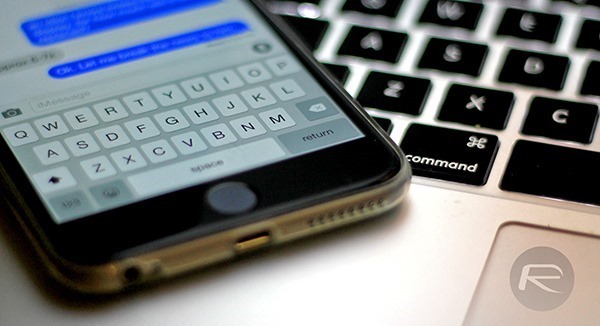 Have you ever been involved in a messaging conversation on your iPhone or iPad that has left you so riled up and infuriated that you needed the correct words with the desired strength and effect to properly convey just how angry you are? Of course you have, and chances are that in order to get your point across in that conversation, you’ve attempted to resort to a particular set of expletives that instantly convey your feelings, but inadvertently ended up lightning the tone of the conversation by sending “duck” or “ducking”, thanks to iOS’ autocorrect feature. There is nothing more infuriating than being part of a conversation, typing what you feel to be a perfectly legitimate word – albeit some of which may be deemed a little aggressive – only for Apple’s autocorrect functionality to take that word and turn it into something other than what you wanted. Sometimes the issue is based on context, but other times it’s just down to the fact that Apple’s underlying dictionary within iOS just doesn’t recognize what you’re trying to type as a genuinely legitimate word, so it gives you what it feels is the correct alternative. Thankfully, thanks to this tip that we have received, all is not lost, meaning that it’s perfectly possible to actually convince, or trick, Apple’s iOS platform into actually recognizing your expletives as legitimate words so that you can use them as you wish throughout your conversations. 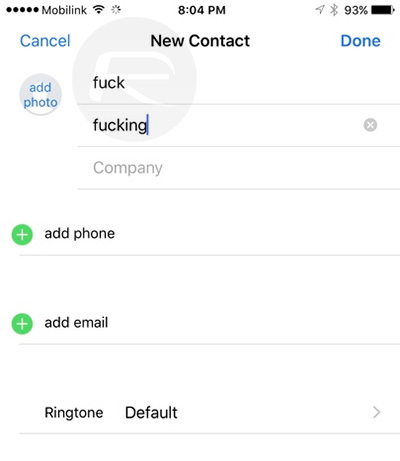 If we take the aforementioned “duck” and “ducking” for the words “fu*k” and “fu*k*ng”as an example, then it’s possible to just create fake contacts in the stock Contacts app with the name of the profanity you most frequently use to ensure that iOS recognizes these words going forward. It doesn’t seem like the best way of doing it, but it is a quick fix which actually works, and should give you a little chuckle to when scrolling through the Contacts app. Alternatively, it’s also possible to add full words directly into Apple’s iOS dictionary via the text replacement feature that can be found in Settings > General > Keyboard > Text Replacement. Both options work, and both options will give you the desired outcome, but let’s be honest, the former is definitely going to provide the most hilarity going forward. 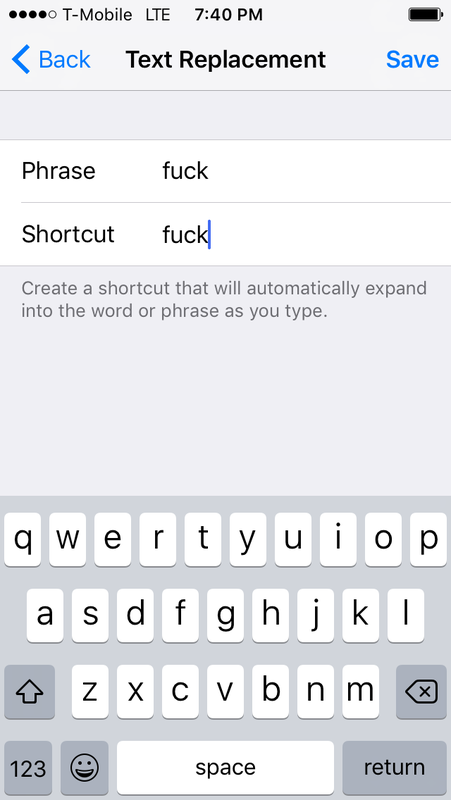 Why not just use the Text Replacement feature already built in to iOS…if you add “f*ck” and have it change to “f*ck” the issue goes away, because iOS will then recognize “f*ck” as a word, even though you’re not really changing anything. That’s exactly what I was gonna say. Easier…Better, and much more convenient than filling your contacts with heaps of random words. Suggesting the use of contacts is, well, really dumb. Except that iOS won’t let you save this text replacement. The phrase and shortcut can’t be the same. Yea, my fault. You have to leave off the shortcut and just put in the phrase, then it will save.